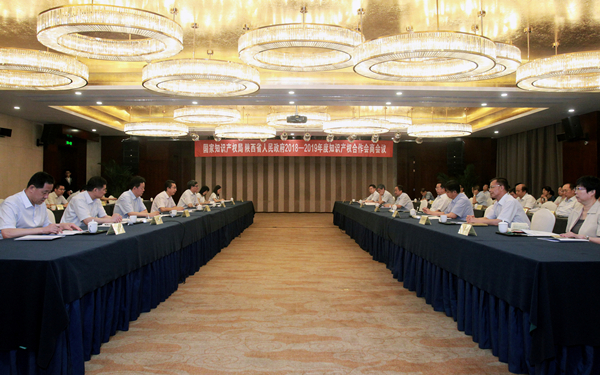 On July 24, the State Intellectual Property Office (SIPO) and the People’s Government of Shaanxi held a consultation meeting on IPR cooperation in 2018 – 2019 in Xi’an. Prior to the meeting, Liu Guozhong, Vice Secretary of Provincial Party Committee and Governor of Shaanxi Province met Shen Changyu, SIPO Commissioner. Both sides had in-depth discussion concerning the cooperation consultation and the work to accelerate the construction of a province advanced in IPR. Shen Changyu and Lu Yeyuan, Vice Governor of Shaanxi attended the consultation meeting and delivered remarks. At the meeting, He Hua, Deputy Head of SIPO introduced the highlight of the 2018 -2019 consultation work. Lan Jianwen, Vice Secretary-General of Shaanxi Government summarized the important progress achieved in the cooperation consultation over the past year. The relevant officials of SIPO and main government departments of Shaanxi Province attended the meeting.